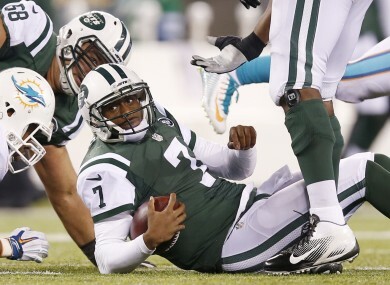 This has been a familiar sight for Jets fans this season. CALEB STURGIS KICKED The go-ahead field goal with just under two minutes left as the Miami Dolphins rallied for a 16-13 NFL win over the last-place New York Jets on Monday. Jets quarterback Geno Smith was intercepted by Miami safety Reshad Jones with 39 seconds remaining to seal the outcome. Smith had attempted just a half dozen passes heading into his final fourth quarter drive. The Dolphins are one of six teams with 7-5 records in the American Football Conference, but are currently the second wild card in the conference playoff race due to the tiebreaker. Miami had been 0-3 in games this season decided by four points or fewer. That included a 39-36 loss last Sunday when it blew an 11-point fourth quarter lead. The Dolphins also surrendered late leads to Green Bay in week six and Detroit in week 10. But Miami was down by seven heading into the fourth on Monday night and posted just its second victory in its last 50 games on the road when it trailed at any point in the fourth. Quarterback Ryan Tannehill was 25-of-35 for 235 yards with an interception for the Dolphins, who have won five of their last seven games. Running back Lamar Miller carried 13 times for 56 yards and a touchdown. The Jets, who dropped to 2-10 on the season, called 49 run plays for 277 yards and their 13 pass attempts were an NFL season low. Eight different Jets carried the ball with Chris Johnson leading the way with 17 carries for 105 yards. Chris Ivory gained 62 yards on 16 runs for New York, which has dropped two straight. Smith was seven-of-13 for 65 yards in the loss. The Redzone: Would a Patriots v Packers rematch make the perfect Super Bowl? Email “Could Rex Ryan be leaving on a Jets plane after latest loss?”. Feedback on “Could Rex Ryan be leaving on a Jets plane after latest loss?”.